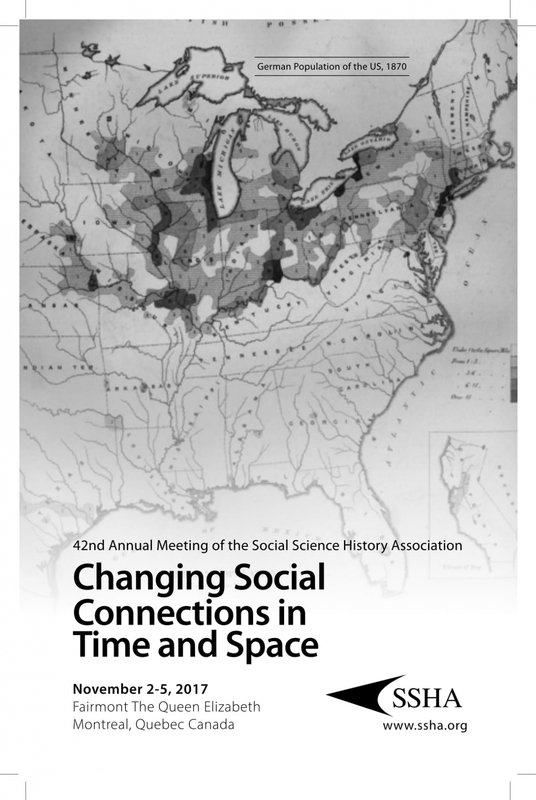 The KFG "Multiple Secularities" will present its research at the 42nd Annual Meeting of the Social Science History Association (SSHA) from 2 to 5 November 2017 in Montreal. On 2 November our directors Monika Wohlrab-Sahr and Christoph Kleine will present a panel on Secularity before Secularism: Historical Pathways in Comparison together with our former fellows in residence Nahid Mozaffari and Armando Salvatore, as well as our Senior Researcher Marian Burchardt and Uta Karstein from Leipzig University. The latter two will also contribute to the panel The Art of Governing Circulation: Politics, Law and Global Assemblages on 3 November. Finally Monika Wohlrab-Sahr and Marian Burchardt will also partake in the panel Revisiting Secularization and Secularism in Quebec on 4 November. Nahid Mozaffari: Sites of Secularity in Early Twentieth Century Iran. Until recently, historians of Iran have tended to regard the period between the political failure of the constitutional revolution (1906-11) and the establishment of the Pahlavi dynasty in 1925 as a time of turmoil and not worthy of focused historical and sociological research. I aim to explore how the cultural accomplishments and repercussions of the constitutional revolution, such as the establishment of more schools, the encouragement of women's education, the propagation of independent newspapers and political and cultural associations, and emerging concepts of nationhood and citizenship, evolved and/or were reconfigured in society. I argue that during this period of turmoil and transformation, the expansion of recently formed and reformed institutions and associations and the emergence of new sites of modern cultural production, led to the creation of a variety of secular spaces in the expanded public sphere. I attempt to explain the boundaries and conceptual distinctions that lead me to identify such spaces as secular, and discuss the differentiations that occurred in society to transform institutions, social spheres, and sites of knowledge production such that they became distinct from (but not necessarily opposed to) the sphere of religion. Armando Salvatore: The early modern Ottoman synthesis between Turko-Mongol and Khaldunian ideas of secular spaces. In the last couple of decades both specialized and popular historical works have started to reinterpret the impact of Turko-Mongol practices and norms on late medieval and early modern concepts of legitimacy, charisma, governance and social cohesion, purportedly pressuring Islamic norms related to the shari'a and so creating new secular socio-political spaces. Curiously, however, not much has been said about how such developments were related to the roughly contemporary theory of the proto-sociologist Ibn Khaldun. The paper will examine how both trends (the Turko-Mongol and the Khaldunian) intersected each other and partly merged within early modern Ottoman theory and practice to produce new distinctions and amalgamations between religious and secular ideas (of legitimacy, charisma, governance and social cohesion). Christoph Kleine: The Secular Ground Bass of Pre-modern Japan? Reflections upon the Buddhist Trajectories towards Secularity. Scholars throughout the 20th century have been puzzled by Japans exceptionally rapid and comprehensive modernization according to Western standards. Inspired by Max Weber, thinkers both in Japan and the West tried to find an explanation by searching for functional equivalents of the Protestant ethic within the religious and intellectual history of pre-modern Japan without much success. In this paper I propose that Japans readiness to appropriate Western knowledge regimes and corresponding social institutions can be partly explained by the existence of early and precursory forms of secularity that were propagated in medieval Buddhist discourses. In these influential and widely accepted discourses, it will be argued, a strict distinction between transmundane and mundane affairs was postulated which, in the long run, favored the independent development of social sub-systems and thus functional differentiation, which is usually seen as a core element of both modernization and secularization. Uta Karstein: Between "L'art pour l'art" and Religious Revitalization: Christian Art Societies in the Second Half of the 19th Century. Most sociological research about processes of differentiation and secularization in the 19th century focuses on the emancipation of the various societal spheres from religious influences. This paper discusses how religious institutions responded to such processes of emancipation. I argue that one of the main religious strategies was institutional imitation, i.e. the copying of secular institutions and organizations such as trade unions or political parties by Christian actors. To exemplify this strategy I will discuss the role and impact of religious art societies in the artistic field in 19th century Germany.